I wanted to make something for my colleague who has so generously gave me something that I needed at the moment. 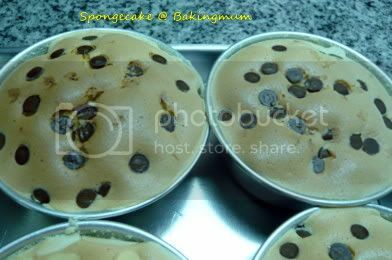 Since I don't have a lot of time to make something elaborated, I baked her some assorted spongecake which will take me less than an hour including baking time. I sprinkled some of them with chocolate chips, some with almond flakes and some I just left it plain. These are the assorted spongecakes. 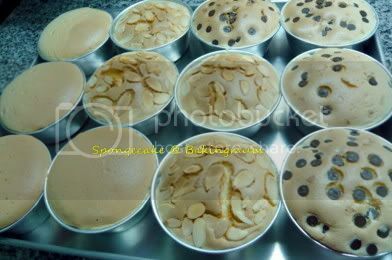 See how puffy and plump the spongecake look when they are just out of the oven. After unmoulding this is how they look. yes it does look very nice. can share the receipe...THANKS! 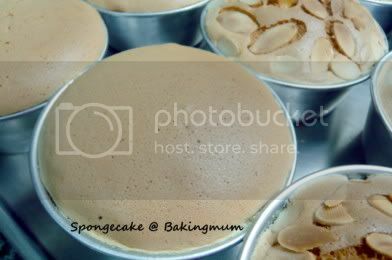 For those of you who are interested, the recipe is the spongecake recipe you can find in my blog. 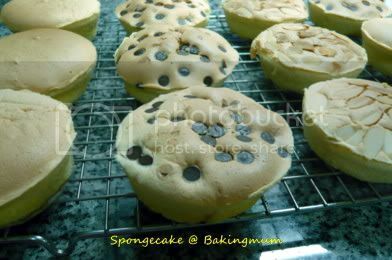 ur spongecake always turn out so nicely and perfect. There is no single crack on the surface, I am wondering how to achieve such result. For me sometimes I got no luck my spongecake surface cracks sometimes (I use SP method). Btw, may I know did you grease the mould? Is it difficult to unmould? 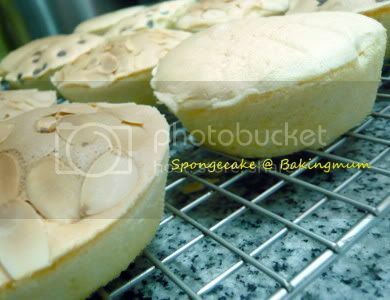 C.B.L., this spongecake recipe also uses spongecake stabliliser. I don't know why but most of the time my spongecake doesn't crack during baking. Maybe it is due to the temp of the oven. Certain part of the oven is hotter. I also don't grease my moulds. Just line the bottom of the mould with baking paper. When the spongecake is cooked, it comes out of the mould easily. Sherreen, I unmould immediately after taking it out of the oven. Cute! Looks really soft and spongy! Bertha, here is the link. Just to to "Baking" and look for spongecake. i tried your spongecake recipe.. first attempt was alright, bit hard but 2nd attempt was GOOD... my gals and hb love it. The 3rd time i try to make again and added pandan paste... taste ok but bit hard. Tibits1, if by adding just 1 tsp of pandan paste it should not make the spongecake hard. Add the pandan paste together with the rest of the ingredients to be mixed. I will try to make one with pandan paste and see how it turns out. Tibits1, if you just sprinkly the chocolate chips and almonds on top before you bake them, it should not sink to the centre. But some of the chocolate chips will sink to the bottom but most of them will still stay on top. 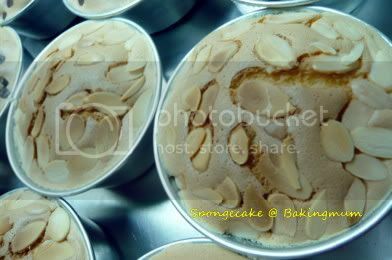 Just gently place the almond slices on top and press gently to let it stick to the batter so that after baking, it won't drop off so easily. Tibits1, I forgot to mention that you can up the milk by another 10 to 15ml if you find the cake too dry. I think those are just a perfect thank you. I don't have a lot of money, but I can cook.. so I give those as gifts quite often. These are just great-- the chocolate chip would be my favorite and I haven't even tasted them. I like spongecake but have not been successful in making them. I guess my hands are not 'light' enough and I prefer not to use stabiliser if I can help it. Will give yours a try. :-) They look good. Thks so much for sharing.